“Giving Voice: The Power of Words in African American Culture” relies on African American oral tradition. Explore venues from a large tent with a loud, boisterous performer in the middle of the Mall to a smaller, more intimate circle of stools arranged for audiences to participate with the storyteller. Activities include theater, poetry, storytelling, radio and humor through performances, discussions, radio broadcasts, childrens programming and community celebrations. “Las Americas: Un Mundo Musical” celebrates the musical traditions and styles prominent in the Americas. This includes the Puerto Rican bomba, plena and jibaro music; Mexican son music; mariachi music; Columbia vallenato, joropo and curralao; Dominican merengue tipico, bachata, and salve; Venezuelan musica llanera; Paraguayan polca; and Salvadoran chanchona music. There is definitely something for everyone! This aspect of the festival continues with performances at the Kennedy Center (http://www.kennedy-center.org/)and the Smithsonian Folkways Tradiciones/Traditions recording series. “Wales Smithsonian Cymru” explores the lifestyles of this rich and industrious nation halfway around the world. Explore various activities including language, literature, crafts & occupational skills, music and cooking of this extraordinary civilization. From pioneering the industrial revolution to being the world’s leader in sustainable solutions, the Welch people have made an exceptionary impact on our world today. The festival starts up again tomorrow (July 1) and continues until July 5. Don’t miss this spectacular cultural opportunity! The Corcoran Gallery of Art and College of Art + Design will open Neighborhood Watch, an exhibition of vintage and contemporary photographs by artist and Corcoran faculty member Claudia Smigrod, on July 1. In Neighborhood Watch, Smigrod revisits the subjects she photographed for her 1989 exhibition, Portraits of Innocence, a documentation of the purity of childhood. Through a recent resurvey of the original Portraits of Innocence participants, Smigrod records the evolution of 20 individuals as she captures them within their native environments in Alexandria, VA.
Smigrod will lead a Gallery talk on the exhibition this Saturday, July 4, at 3 p.m. The DC Commission on the Arts and Humanities is pleased to present the DC Hip-Hop Theater Festival, beginning on Monday, July 6, 2009. Highlights for this year include a deeper level of engagement with local artists through a residency program with Amsterdam based choreographer Nita Liam and the addition of a family friendly play taking stage at THEARC Theater in Southeast, a new venue for the festival. Opening the weeklong list of activities and performances is the AM Radio Live Art and Performance in association with ART UNPLUGGED at 7 p.m. at The Library Saloon, located at 3514 12th St., NE. Events also expected to draw large crowds are “The Voices Remix: A People’s History of the United States” with Lupe Fiasco, Michael Ealy, Walter Mosley, Regie Cabico and W. Ellington Felton as well as “Zomo the Rabbit: A Hip-Hop Creation Myth”, the first family friendly program to be included as part of the Festival. Each year, in addition to the various performances, the Festival also incorporates educational components and a forum for District residents and visitors to engage in dialogue that addresses relevant issues affecting the Hip-Hop generation. This year’s topic is A Conversation on the Power of Hip-Hop Arts and Culture to Create Change. The discussion will take place on Wednesday, July 8 at noon in the Flashpoint Mead Theater Lab, located at 916 G St., NW. As with all Commission events, the Festival programs and performances are free and open to the public. Performances will take place at a variety of venues throughout the city including Children’s Hospital, Studio Theater, Dance Place, the Flashpoint Mead Theater Lab, THEARC Theater and the Kennedy Center Terrace Stage. Founded in 2000, The Hip-Hop Theater Festival continues to invigorate the fields of theater and Hip-Hop by nurturing the creation of innovative work within the Hip-Hop aesthetic; presenting and touring American and international artists whose work addresses the issues relevant to the Hip-Hop generation; and serving young, urban communities through outreach and education that celebrates contemporary language and culture. In addition to offering the annual Hip-Hop Theater Festival, the Commission is committed to reaching the District’s arts community to assist in the growth and preservation of Hip-Hop by offering the Hip-Hop Community Arts Initiative, a grant program offering funding for quality Hip-Hop arts activities throughout the city. Grant recipients are invited to submit their funded work to the Hip-Hop Theater Festival. Full Festival schedule can be found at www.hhtf.org. For more information on the Hip-Hop Theater Festival and The DC Commission on the Arts and Humanities, visit dcarts.dc.gov or call 202/724-5613. In these installations of unfired local clays, Boozer's graphic compositions of color, pattern and texture create small geologic events, manifestations of cause and effect celebrating clay's physical properties. Colors change, shapes warp, cracks emerge as counterpoint the artist's hand in these fragile and mutable works that cross genres between painting and sculpture, abstraction and representation." Opening: July 3, 2009 6 p.m. - 9 p.m.
Hillyer Art Space at 9 Hillyer Court, NW, presents Six in the Mix, a group exhibition curated by famed D.C. artist Renee Stout. The exhibition opens Friday, July 3rd, 2009, with a reception from 6 p.m. to 9 p.m. featuring music by DJ Deep Sang. $5 suggested donation. The exhibition closes Friday, August 28, 2009. Six in the Mix: Selections by Renee Stout brings together a divergent company of mid-Atlantic emerging and mid-career artists for Hillyer Art Space’s summer program. This show will feature the work of Cianne Fragione, Kenyatta Hinkle, Adam Griffiths, Marc Roman, James Swainbank, and Gilbert Trent. Stout has set out to create a mixed bag of local talent not based in the obligatory conceptual framework predominantly exhibited in group shows. Instead of the varying inspiration and ideas behind the individual bodies of work, it is the “natural dialogue that may occur between these works” which Stout would like the audience to experience. “I also didn’t want the viewer to come into the exhibition with preconceived ideas about the works based on any theme that I had imposed. 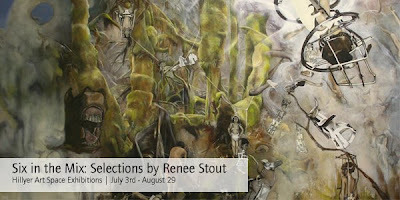 Instead, I simply chose to select work that resonated with me on an intuitive level, but there is no doubt that my penchant for political conspiracy theories, personal and cultural sensitivity to notions of beauty and my childhood love for horror films and Mad Magazine creeped in during the process,” says Stout. When poets met CAFÉ, it was love at first sight. Soon they moved in together. The romance goes on. Poets sit, read, eavesdrop, write, or hide in CAFÉ; CAFÉ’s mood is set by its poets. Words are skimmed, penned, typed, exchanged, gathered and discussed. Please come celebrate poets, CAFÉ, and their life together, on Thursday July 2, 5-8:30, in the café at The Phillips Collection, Washington DC. Come and do what poets do: read, eavesdrop, play, eat, write, hide, or – whatever you like. There will be no requirement to read or to listen, and no open mic. There will be plenty of poets and opportunities to be poetic. The Phillips Collection also invites poets to bring a book for donation to their BOOK collection: poetry or not, whatever you’d like to read in a café. Please RSVP to db[at]dbfoundation.org if you can come. Let them know if you are a poet, and they will put your name on their POET list. CAFÉ is open: Tuesday-Saturday 10AM-5PM; Thursday 10AM-8:30PM; Sunday 11AM-6PM. The first Thursday evening of each month an evening is dedicated to one of CAFÉ's elements. The IDB Cultural Center cordially invites you to visit the exhibition "Selections from 50 Years, 50 Works," at the IDB Cultural Center Gallery (1300 New York Avenue, N.W. ), which was shown in Medellín, Colombia, in March-May of this year, on occasion of the 50th Anniversary of the Inter-American Development Bank. Located at 20 Baltimore Avenue in the heart of Rehoboth Beach, Delaware's thriving Arts District, GALLERY C is the area's latest contemporary, fine art display space. Our 775 square foot gallery is host to monthly exhibtions featuring original works of contemporary, fine art by regional, national, and international artists. Gallery exhibitions will be curated by visual artist Michael Sprouse who is also Executive Director of the gallery, as well as BASE (www.BASEartists.com). Sprouse is also Associate Director and Publicist for of the Rehoboth Beach Theatre of the Arts as well as Secretary and Marketing & Advertising Director for the Delaware Charitable Music, Inc. – a 501C3 corporation (www.demusic.org). Sprouse was owner and curator for the acclaimed Eklektikos Gallery of Art in Washington, DC for 11 years prior to moving to the Rehoboth Beach area in 2002. A visual artist for over 25 years, Sprouse’s award winning works can be found in private and public collections across the United States, Europe, Canada, and South America. The initial exhibition for Gallery C will consist of recent works by Sprouse (www.sprouseart.com) as well as works by the award winning Philadelphia based husband & wife team, artists Michael Scotko (www. michaelscotko.com)and Karen Kiick (www.karenkiick.com). Scotko specializes in miniature, contemporary landscape pastel paintings and Kiick creates mixed-media collage and Venetian plaster works on board and tile. Also highlighting the event will be the free performance and Glenn Miller style dance event on the Rehoboth Beach Theatre of the Arts’ stage by the Milford Community Smooth Sound Dance Band (www.milfordcommunityband.org) courtesy of the Delaware Charitable Music, Inc. from 8 to 10 PM. It's a fantatsic opportunity to see all that the Rehoboth Beach Theatre of the Arts has to offer our area. This is a free event and a perfect way to dance to the smooth, Big Band stlye sounds by such great artists as Glenn Miller, Tommy Dorsey, Cab Calloway, Les Brown, and much more! Join the Warehouse Gallery and Theater to commemorate the 20th anniversary of the event with a presentation featuring two of the original organizers of the demonstration, Andrea Pollan (curator, writer, and Director of Curator's Office) and Bill Wooby (local arts entrepreneur and visionary) as well as former WPA Trustee and First Amendment rights attorney, Jim Fitzpatrick. The discussion will be moderated by Andy Grundberg, chair of the photography department at the Corcoran College of Art & Design and former art critic for The New York Times. Panelists will discuss the assault on the National Endowment for the Arts and its lasting effects, issues of censorship, the story behind the demonstration, and how the WPA came to present the exhibition. The panel discussion will be followed by a reception in the Warehouse Café (cash bar) with many of the event's original participants and the opportunity to purchase a limited-edition t-shirt featuring an image created by artist Scott Bennett for the 1989 demonstration. Greater Reston Arts Center announces a celebratory event with artist Shinji Turner-Yamamoto and filmmaker Andrea Tree for the year-long Sleeping Tree project. Turner-Yamamoto will sign his catalog documenting the installation of Sleeping Tree from its uprooting in Governor’s Square to its final installation as public art at Dogwood Elementary School. Filmmaker Tree accompanied the artist along the entire journey. Her sensitive work, with its original score, captures the community effort supporting this successful project. Sleeping Tree was a long-term, collaborative endeavor connecting the artist and the arts center with a wide cross-section of people who donated their skills, equipment, and labor to make Turner-Yamamoto’s concept a reality. Sleeping Tree is one of Turner-Yamamoto’s Global Tree Projects, site-specific installations he has mounted in India, Ireland, Japan, and now Virginia. Through these varied projects the artist offers viewers a new, more personal way to see trees. This particular project also offered the community unique opportunities to participate in public art by assisting the artist in transporting the tree, visiting the gallery to experience the installation first-hand, and viewing the tree in its outdoor setting where nature has taken over as the artist’s collaborator. Throughout the project filmmaker Andrea Tree documented Turner-Yamamoto while he installed both the indoor and the outdoor exhibitions. Her twenty minute film is a rare view of an artist deeply absorbed in his own process, set to an original score by composer and pianist, Javier Ledesma. The forty-eight page catalog, designed by the artist, chronicles the entire journey of the tree and features an essay by independent critic and curator, Sarah Tanguy. Copies will be on sale at the arts center.Catalogs are$25 non-members or $20 members. A special forum featuring visual art, music, poetry and dance. Join us in a special dialogue about how art can play a role as an agent for education and treatment for people who are at risk or have been affected with HIV or AIDS. This forum will feature spoken word and other performances as well as representatives from the art community that is making a difference in the fight against HIV. Artwork from representing organizations will also be on view. Arts for Global Development, Inc.
For more information about Artomatic, visit the website here. The most important retrospective exhibition ever devoted to New York artist Thomas Nozkowski recently opened at the National Gallery of Canada. Until September 20, some 60 works painted since 1980 by the internationally renowned artist will be on view in the Gallery’s Contemporary Art galleries. Although Nozkowski’s art career spans four decades, this is his first exhibition in Canada. One of the greatest and most influential artists of his generation, he has made a significant contribution to the field of abstract painting. Thomas Nozkowski is the first exhibition organized at the National Gallery of Canada by the Gallery’s new director, Marc Mayer, since he arrived in January 2009. “He is daring, pushes his work to the limit, and reinvents himself in each painting. He is a true revolutionary,” Mayer commented. The director of the National Gallery of Canada and curator of the exhibition Thomas Nozkowski will talk about the exhibition on Friday, 26 June, at 12:15 pm in English and at 2 pm in French. Included with Gallery admission. A bilingual catalogue accompanies the exhibition Thomas Nozkowski. Co-written by Marc Mayer, director of the NGC and curator of the exhibition, and Robert Storr, dean of the Yale University School of Art (New Haven, Connecticut), the 184-page book includes 70 colour illustrations. Hardcover. On sale at the NGC Bookstore for $60 (plus taxes) and at www.ShopNGC.ca, the Gallery’s online boutique. To find out more about the artist and the exhibition, visit www.gallery.ca/nozkowski. oil on canvas and paper, 30" x 24"
Check out the local artist vendors, the North Hall Exhibition, Eastern Market Artists Interpreting Eastern Market murals along the East Hall Alley and more. 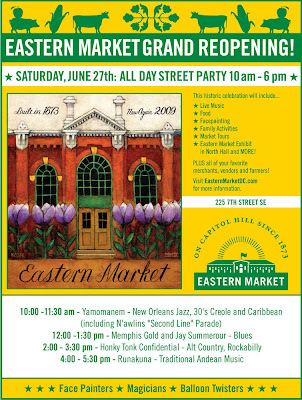 WASHINGTON, DC – Mayor Adrian M. Fenty announced that the District will reopen the historic Eastern Market at a ribbon-cutting ceremony on Friday, June 26 followed by a community celebration on Saturday, June 27. The two events will mark the completion of the market’s renovation and recovery from fire damage caused in April 2007. On Sunday June 14, vendors who operate temporarily in East Hall will start a step-by-step relocation plan to move back into the historic South Hall and be open for business for the ribbon-cutting on Friday June 26. The outdoor farmers and exhibitors market will continue as usual over the weekend of June 20-21. “I’m thrilled that Eastern Market is on the verge of reopening. The devastating fire was a blow to our whole community, but the way in which the city rallied around the Market as more than just a building proved how important it is to the fabric of our neighborhood. I want to thank Mayor Fenty and his staff for making the rebuilding effort a priority, and working hand-in-hand with EMCAC, ANC 6B, the Capitol Hill Community Foundation and all of our neighborhood leaders,” commented Councilmember Tommy Wells (Ward 6). Renovations to the oldest continually operating market in the city are on schedule and will cost $22 million. The market will have modern heating and air conditioning, new restrooms and sprinklers and access ramps to comply with the Americans with Disabilities Act. The skylights and chimneys have been restored and new windows have been installed that protect against ultraviolet (UV) light. The North Hall will include a movable stage and gallery walls, a demountable dance floor and theatrical lighting making it attractive for community and rental use. The reopening will also mark the conclusion of a new streetscape in front of the market. The Office of Property Management and the District Department of Transportation worked together to minimize disruptions and complete projects simultaneously. The new street includes upgrades of the roadway and roadbed and installation of new brick sidewalks, granite curbs, utilities and lighting. The renovation process has been a collaborative effort between Quinn Evans Architects, Minkoff Company, Inc., Keystone Plus Construction, FEI Construction and The Temple Group. Located in the historic district of Capitol Hill, Eastern Market has continually offered District residents and tourists with daily produce, meat, cheese and bakery vendors, a weekend farmers market and craft sales while also operating as an informal community center. Nine of the Eastern Market Window murals are on display in the first floor music room at Artomatic thru The DC Creates! Public Art Program. The Passionate Collector: Look at this art. It'll change your life. As part of the Whole Lotta Love Weekend on July 3-4, 2009 at CAMP Rehoboth in Rehoboth Beach, DE, over 200 artists have created postcard-sized works of art, each for sale for $100. Among the artists, over 15% are represented in museums or major collections, and they reside in 10 states as far away as CA and FL with 78 residing fulltime in DE." Buy LottoHEART Tickets: Each $100 Ticket Includes an Original Work of Art! VISIT THE WEB GALLERY! Visit here. The preview is free and open to the public. 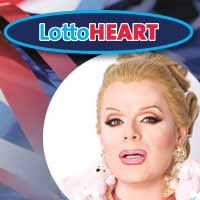 LottoHEART Game Show July 3rd! 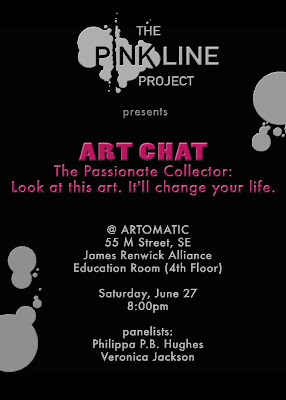 Your $100 ticket gets you into the event and guarantees you a piece of art. Buy your $100 Blind Date ticket and you receive a random piece of art from the same terrific pool of talented artists. CAMP Rehoboth, 37 Baltimore Avenue, Rehoboth Beach, DE. CAMP Rehoboth is a non-profit, gay and lesbian community service organization, originally developed to “Create A More Positive” relationship among all the people of the Rehoboth Beach area. Over the last 18 years it has grown into a full service community center with a multitude of activities, events, and programs.